Innovation in Healthcare summit round up! Around 200 people attended or watched the live stream of our Innovation in Healthcare summit, hosted on Monday 11 December 2017 at the RHS Lindley Hall in London. The event was hosted in partnership with the World Innovation Summit for Health (WISH) and Imperial College’s IGHI (Institute of Global Health Innovation). Also presenting were Ahmad Nabeel and Anwar Almojarkesh, winners of Qatar’s Stars of Science competition, who presented on their respective inventions – a self-cleaning laparoscope and Braci – a safety pillow for the hearing-impaired. They also demonstrated their inventions over the lunchtime break, together with Orbis, a flying eye hospital which gives communities across the world access to quality eye care, fighting blindness and restoring vision for those who need it most. Read the event programme here. Download slides from the day here. View a highlights video from the day here. View presentation videos from the day here. 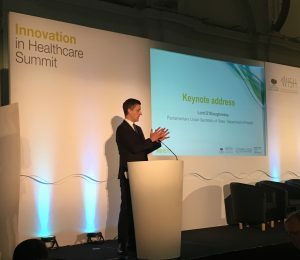 The event, which received over 38,000 impressions on Twitter, focused on a range of perspectives on innovation in healthcare, with Lord O’Shaughnessy outlining current national government policy, and Adam Hill bringing in perspectives from industry on implementing rapid innovation. David Halpern’s session focused on how we can use behavioural insights and nudge theory to drives improvements in healthcare, whilst Eric Langshur and Victor Dzau introduced perspectives from the USA on creating the demand side of innovation, and eco-systems to support it. There were also a series of panel sessions, featuring speakers from a range of organisations including AHSNs, NHS Trusts, NHS England and the Health Foundation. The panels focused on global and UK perspectives on innovation, with the final panel discussing practical advice and learnings from implementing innovation on the frontline. Participants gave positive feedback on both the plenary and panel sessions, with all presentations rated as good or above. Look at the #IIHS17 hashtag on Twitter to find out more about the day! One year on: Discover goes from strength to strength!